Here’s what’s up in the world of TV for Tuesday, November 22. All times are Eastern. Drunk History (Comedy Central, 10:30 p.m.): Depending on the political outlook of your family and if you’re actually seeing them this week, Thanksgiving might serve as a much-needed decompression chamber from recent events. Hell, even if dinner-table arguments are inevitable, the main focus should still be on food, right? Food, glorious food—that great unifier of humankind. 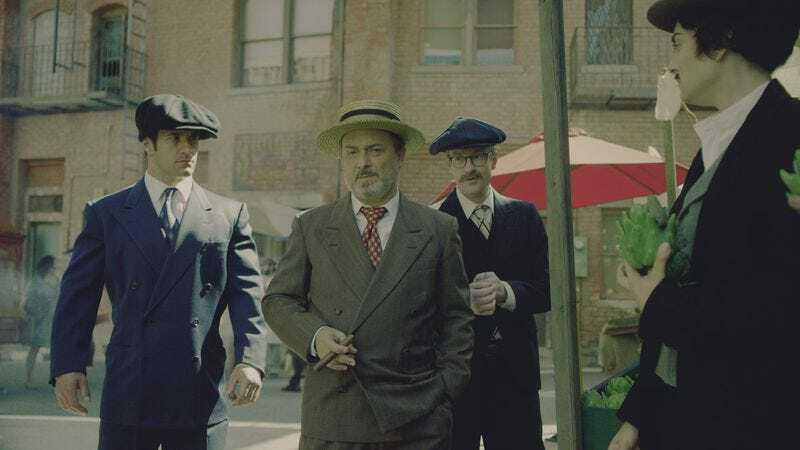 Drunk History knows what’s up, and is proving it by devoting an entire episode to the stuff. Included amongst the stranger-than-fiction, culinary tales of yore is Mayor Fiorello LaGuardia’s 1935 ban on artichokes in New York City. Apparently, it was enacted to fight the thistles’ high prices, which were being inflated by the mob. More importantly, did you know artichokes are classified as thistles? Neither did we. Kayla Kumari Upadhyaya will be standing by with fork in hand to reveal other nuggets of delicious historical trivia. WWE Smackdown! Live (USA, 8 p.m.): What’s slated to happen on Smackdown! from week to week is anyone’s guess, but seeing as yet another Survivor Series (known for being WWE’s “Thanksgiving tradition”) passed without an appearance from half-man/half-turkey wrestler The Gobbledy Gooker, we’re hoping he’ll come out of his (egg)shell tonight. Sadly, he hasn’t been seen in earnest since WrestleMania X-Seven in 2001, which makes him the wrestling-gimmick equivalent to The Great Pumpkin. And no, New Day’s Xavier Woods (then later Jey Uso) posing as the Gobbledy last year doesn’t count. LaToya Ferguson will keep an eye on the ring for any true man-turkey sightings. Brooklyn Nine-Nine (Fox, 8 p.m.): We know, we know—Brooklyn Nine-Nine already made What’s On Tonight’s top picks last week. But it was on hiatus for so long that it deserves the overexposure. Also, it’s the Thanksgiving special, so hopefully it will inspire viewers to embrace the hell out of the holiday this year. You all deserve it, as does—you guessed it—LaToya Ferguson, who will turn to the magic of DVR and her formidable work ethic to pull double duty tonight. New Girl (Fox, 8:30 p.m.): And wherever Brooklyn Nine-Nine goes now, so does New Girl, and vice versa. Jess and the gang are having their annual Thanksgiving special, too. The episode’s titled “Last Thanksgiving,” which is hopefully just a funny name and not a prediction about the future status of the holiday—and the country in general. Sorry, we’ll stop with the gallows humor now. Emily L. Stephens remains hopeful. Rocky III (Amazon/Hulu): Marathoning all of the Rocky films has become almost as much of a Thanksgiving staple as watching the Macy’s parade, so here’s a hot take: outside of last year’s Creed, Rocky III is the best sequel of the series. II is undoubtedly a more competent film, but III has the good sense to satirize the franchise’s popularity, then bring Rocky Balboa back to his slobbish, pugilistic roots around the halfway point. It’s no accident that Rock has to forget about the wealth, material indulgences, and faux classiness before he can truly think about defeating Mr. T’s brash antagonist, Clubber Lang. And even if that sounds like we’re giving the film way too much thematic credit, it has enough weirdo meta details to make it a worthwhile watch, from the hero being disgusted by the real-life Rocky statue in Philadelphia to Sylvester Stallone’s Muppet Show footage being pawned off as Balboa’s own. Ay yo, Happy Thanksgiving!